Tablets, and specifically the iPad from Apple, have been one of the big drivers for growth in mobile in the last couple of years, but figures out today from NPD indicate that their popularity is going to get even bigger: the market for tablets, its researchers predict, is set to boom from 121 million shipped tablets today to 416 million devices by 2017, when they will overtake notebooks to become the most popular mobile PC device, driven by a drop in costs and a rise in features. 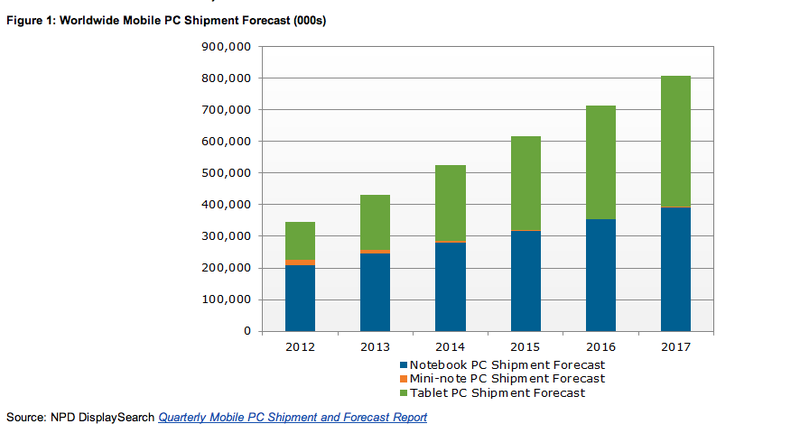 Overall mobile PC shipments will reach 809 million units by 2017, from 347 million today. But over that time, the rise of tablets will remain largely a story about developed/mature markets. Regions like North America and Western Europe, along with single countries like Japan, currently account for 66 percent of all tablet shipments (and most likely sales), and that proportion, NPD predicts, will remain in the 60 percent range for the next five years. That works out to 254 million units by 2017, versus 80 million today. NPD seems to say that this is partly due to a lack of infrastructure and available services in developing markets, but also that it is something of a self-fulfilling prophecy: vendors continue to focus on the mature markets with their new products, so that’s where they get bought: “New entrants are tending to launch their initial products in mature markets,” Richard Shim, senior analyst at NPD DisplaySearch, notes in a statement. The rise of tablets is also a story about the decline of notebooks. The market for these will continue to expand, but at a rate lower than the 28 percent that tablets will see: NPD says that by 2017 there will be 393 million notebooks shipped compared to 208 million today. One takeaway from this: although Apple with its iPad line of tablets has dominated the tablet world in market and mindshare up to now, the space is far from penetrated, and that means that companies like Microsoft, Google and others still have a lot to play for. Another is that we may continue to see a pressure on price, but that won’t necessarily mean a shortcut on features. Amazon has, by some estimates, ushered in the “death of the spec” with its Kindle Fire tablet, which pares down expensive features like cameras in favor of delivering a sub-$200 device, but NPD notes that it will be the features on those tablets — instant-on capability, battery life, portability, as well as multi-core processors, hi-res displays — that will make them a “compelling alternative” to notebooks for the mobile consumer. Part of the reason we will see a lot of features continue to be incorporated into tablets is because of the emphasis of content on the devices. App stores are increasingly catering to tablet users. And figures from NPD itself indicate how they are becoming a major platform for traditional TV consumption. This kind of usage screams for better screens, faster processors and just generally awesome hardware. But by the way, this is not to say notebooks are dying. Far from it — they will still account for 49 percent of the mobile PC market, NPD says, shipping 393 million units in 2017 compared to 208 million in 2012. It adds that notebook makers are also taking heed and looking to put more tablet-like features into their products — for example, becoming thinner and incorporating touch functionality.